Medical professionals have been yearning for a long-term solution for erectile dysfunction. 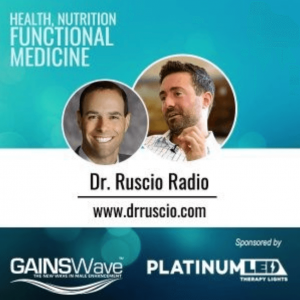 On a recent episode of Dr. Ruscio Radio, Board-certified Urologist, Judson Brandeis discusses how GAINSWave ® is an optimal solution for men with this condition. Many medical practices aren’t properly equipped to provide solutions for erectile dysfunction, until now. What Is Shockwave Therapy (GAINSWave)? During the podcast, Dr. Brandeis shares his original skepticism with utilizing GAINSWave to treat erectile dysfunction and Peyronie’s disease. “I was initially really skeptical, like, could this actually work? I delved into the literature and I researched it. I flew out to Miami. I got trained in GAINSWave. I came back to Walnut Creek and I decided I was going to bring this to northern California,” responds Brandeis. Dr. Judson Brandeis, along with more than three hundred medical professionals across the United States are leveraging the marketing support and resources that come packaged with this turnkey solution to grow their practices. If you’re interested in learning more about the treatment or becoming a provider, contact a GAINSWave specialist at (855) 383-5779. If you’re ready to see firsthand why patients are raving about this treatment and why current providers have enhanced their practice by implementing GAINSWave, then click here to learn how to become a provider.